I've often wondered about this plaque, which it outside 227 Smith Street in Boerum Hill, Brooklyn. It's quite old, having been placed there in 1956, when the area was still largely Italian, with some Irish and Scandinavian thrown in. Given that it was put up there by "The Boys," I assumed there was some sort of Mob connection, and Pop was a local don. But, on reflection, that makes no sense. Why would such men advertise their presence? Turns out Torello—real name Nick—was a humble bartender, who ran a bar and restaurant on Smith Street near Butler. There was a bar here called the Golden Eagle Bar and Grill in the 1940s, so that's probably where he worked. 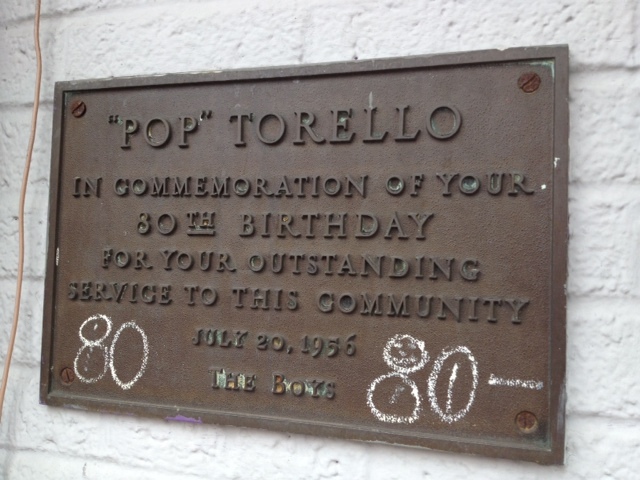 Torello also seemed to have owned the building, as he made some sort of renovations to it in 1951. The bar was the target of a robbery in 1946. In the 1880s, there was a bowling alley at this address, called Golden Eagle Alleys. I've heard that remnants of the alleys remain in the basement. In 1885, a 14-year-old boy was struck by a bowling ball in the ankle. He fractured his ankle, got blood poisoning and died. No charges were filed. Chalk up another loss for the dwindling New York Jewish Deli scene. 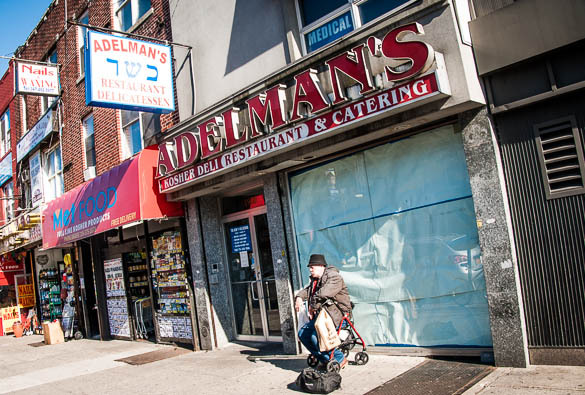 Following the closure of Stage Deli, and the fire at Sarge's, we learn from Sheepshead Bites that Adelman's Kosher Deli, which has stood at 1906 Kings Highway for 60 years, shut its doors on March 25. The eatery had closed for Passover, as it does every year. Only this time, it never reopened. The phone number has been disconnected. "According to a representative for the landlord, however," wrote the blog, "the neighborhood staple had fallen far behind on rent and was having money troubles. The landlord won an eviction against the business operator after failing to strike a deal." But there's a small glimmer of hope. "The landlord, Waldorf Realty Co., said that there’s still a chance Adelman’s could reopen. The evicted owner was not the original owner of the restaurant, and the original owner may still have the right to seize the business and take over the lease." The most recent owner was Mohamed Salem, who won some press for being a Egyptian Muslim who served a Jewish clientele. Adelman's began its life in Borough Park. It was at its current location for the past 30 years. Its walls were covered with sports memorabilia. There are two kosher delis remaining in Sheepshead Bay: Jay & Lloyd’s Kosher Deli (2718 Avenue U) and Mill Basin Deli (5823 Avenue T). 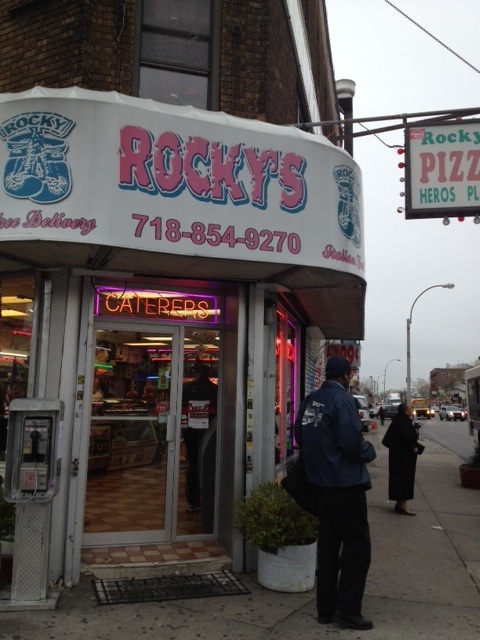 Rocky's Pizza in Kensington, Brooklyn, doesn't rank as classic New York. But it's an interesting slice of specific Gotham history. It was founded in 1979, nearly 35 years ago. And in case you haven't guessed, it was named after a certain popular movie of the time. See the poster below. That's the original item. Posters for other "Rocky" films in the franchise hang elsewhere in the pizzeria. The City never learns. Nobody learns. Five years ago, I found out that a group of buildings that once housed several of the historic music publishing buildings that made up Tin Pan Alley, the cultural entity that did nothing less than create the Great American Songbook, were on the block, in danger of being torn down and replaced by apartment towers. The media leaped on the story, bemoaning the street's probable fate. Between that, and the economic crash of late 2008, the buildings were saved. That is, they weren't demolished. But neither were they preserved through landmarking, as they should have been. As they should have been long ago. Well, the same strip of five-story buildings—47 through 55 W. 28th Street—are again up for sale. And again the agent is the ravenous Massey Knakal, which has done more than any other real estate agency in the city to decimate the city's architectural and cultural heritage. "This Chelsea/Madison Square Park nighborhood has experienced a unique renaissance of hotel conversions, recent residential developments, office building restorations, trendy eatery's [sic] and excellent shopping," the listing breathlessly relates. "All retail units could be delivered vacant." Additionally, No. 45 is also up for sale, but by a different realtor. 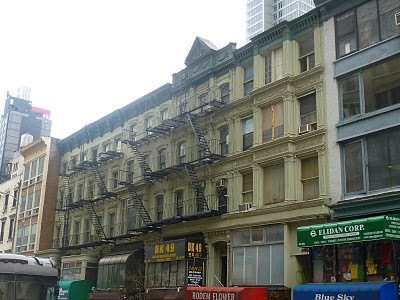 Back in 2008, there was an effort to get the whole block of W. 28th Street between Broadway Fifth landmarked. The Landmarks Commission expressed interest, but has done nothing in the ensuing five years. Since then, the tenants of the buildings won a legal campaign and no longer face eviction, and, as part of the settlement, the buildings have had restorative façade work done. You can learn more about what's in danger of being lost here, here and here. 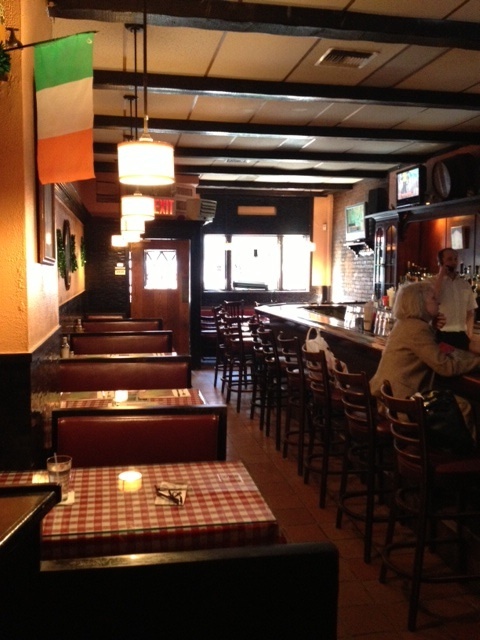 I recently paid what I expect to be my final visit to the Emerald Inn, the small but sweet Irish pub on Columbus Avenue on the Upper West Side. 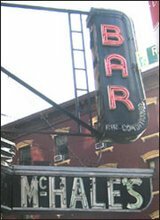 Chased out by an astronomical rent hike ($17,500 to $35,000 a month, thank you very much), the 70-year-old bar will close May 1. It will be replaced by a Kate Spade store. 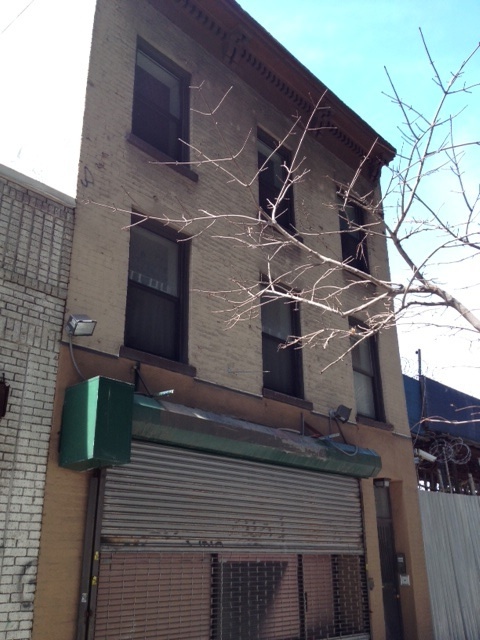 The semi-good news is that the Emerald will relocate to a new space on W. 72nd Street. I have an innate respect and affection for any old, weatherbeaten, New York survivor. But, that said, my main interest in the Emerald—and the reason it will hurt when it's gone—is its status as a location for my second-favorite New York movie, Billy Wilder's "The Apartment." (My favorite is "The Sweet Smell of Success.") When Jack Lemmon's C.C. Baxter learns that the love of his life, elevator operator Fran Kubelik (played by Shirley MacLaine) is the mistress of his unctuous boss, Jeff Sheldrake (Fred McMurray), he retreats to this bar and gets smashed on Christmas Eve, all the while wearing his new bowler hat. I gave the bar a long look as I sipped at my beer. Something wasn't right. Parts of it looked like the bar in "The Apartment." But the joint wasn't nearly big enough. The scene in the movie shows a long bar, angled on either end, with stools on all three sides. The Emerald's current bar is stubby, and cuts off abruptly at the far end—the end where Baxter and his pick-up of the evening, Margie MacDougall, swilled their drinks. The website Scouting New York, which did an extensive post on the locations seen in "The Apartment" noticed the same thing. So I began asking questions. 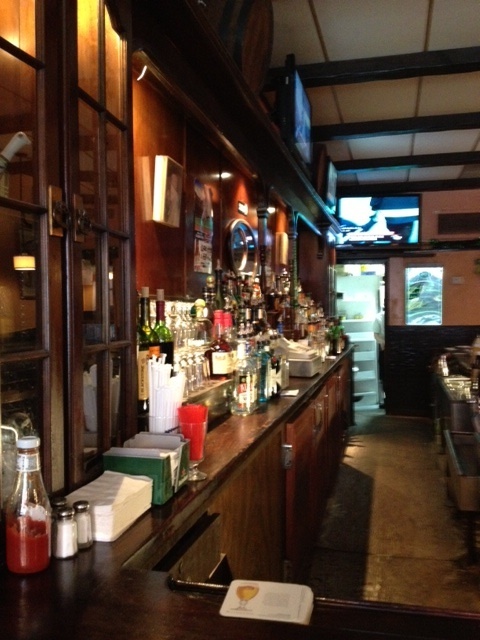 The bartender confirmed that, around 1976, the bar had been remodeled and shortened. The Emerald has always served food. But back in the old days, when city regulations weren't so stringent, the cooking was done in a shack out back. When the City put the kibosh on that dicey arrangement, the bar was forced to bring the kitchen inside. Something had to give, so the bar was cut in half. Not a lot remained of the old Emerald after that redo. There was once a door toward the back of the bar that led into the office building next door. That is gone. The jukebox that Baxter and Margie dance to is long gone as well. But the wooden top of the bar was preserved and is the same wood that Lemmon leaned his elbows on more than a half century ago. The bartender said that little of the interior would likely make the move to 72nd Street. The new space is already completely outfitting and doesn't need a bar or booths or anything. Moreover, people have been in asking to buy the furnishing. So there's no chance that the new Emerald will evoke the old Emerald seen in "The Apartment." The bartender finally said there was one possible bright spot to being forced out. Kate Spade might decided to removed the dropped ceiling and restore the original pressed tin ceiling that lies under it. If so, that will be the only part of the old Emerald that will remain in the handbag shop. I love it when readers send me photos of wooden phone booths. These are the readers who truly follow the blog and know what it's about. 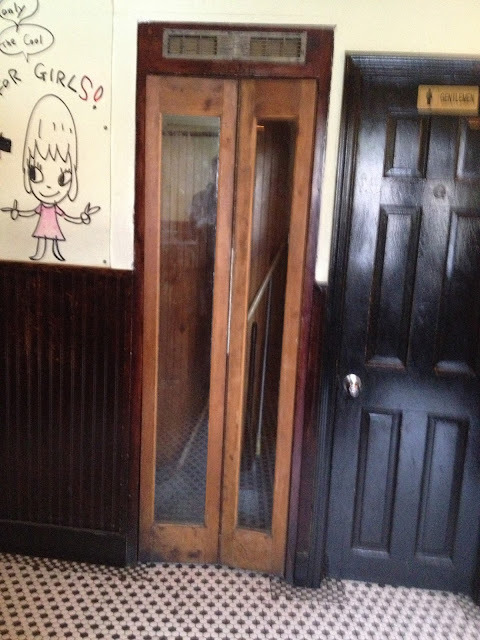 "Kevin" sent this picture of a previously undetected booth at the Niagara Bar in the East Village, at Avenue A and E. 7th. I know the bar well. No phone inside the booth, it goes without saying. Just a mop, broom and a bucket. The indignity! The booth obviously dates from pre-Niagara days. Niagara isn't that old. In the 1970s, this was a City-sponsored "friendship center for older adults" In the '80s, it was King Tut's Wah Wah Hut, a jazz club. In the '90s, it was Wally's Midtown. But the booth surely predates all three. About a month ago, Pizza Moto, a roving pizzamaker that sells freshly baked pies at Brooklyn Flea and other outdoor markets, announced it had found a permanent home in Red Hook, and has started a Kickstarter campaign to finance it. This is the building, 338 Hamilton Avenue, a lonely three-story brick thing shivering under the shadow of the BQE near Court Street. It's quite an old structure. So old that, when Moto ripped down a back wall, they found what they called "a 130-year-old oven," which they plan to revive and use to make the pizzas. Actually, the oven's possibly even older than that. According to a March 1874 article in the Brooklyn Eagle, the John Grace Bakery was here then. Grace won a deed to the land in 1867, but seemed to have surrendered it to the Sheriff in 1880. If this location seems like an odd one to place a bakery, you have to remember that Hamilton Avenue looked a lot different one hundred and so years ago. The highway was not there, but the trolley lines leading to the Hamilton Ferry were. Many hundreds of people passed by the John Grace bakery every day. The ovens are brick-lined and were made by "New System Oven Construction Company" in New Jersey. Pizza Moto still needs about $40,000 to restore the oven. So go and kick in $25 or so, so we can all see what a pizza made in a 19th-century Brooklyn over tastes like. 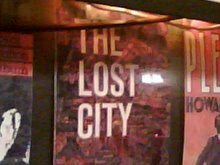 Lost City Asks "Who Goes to Arturo's?" From last week's "Who Goes There?" column on Eater. Wish their pizza was better. (People: better quality tomatoes and a pinch of basil and salt in your sauce, and your problems are solved!) But I have no complaints about the ambiance. 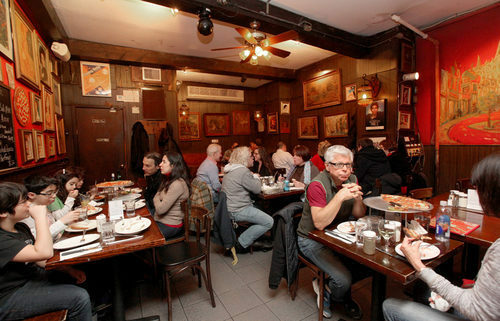 Labels: arturo's, greenwich village, who goes there? When the St. Clair diner, at the corner of Smith and Atlantic, underwent a renovation a few years back, the owners uncovered an old metal sign beneath the newer signage. They didn't tear down the old sign, just covered it up with the even newer signage. At the time, I wondered when I'd ever seen the hidden original sign again. Well, I didn't have to wait long. The new signage has been taken down, and the inside gutted. Signs in the window say the St. Clair is being renovated again. But in three months, I've never seen any work going on inside. The diner is gone for good. 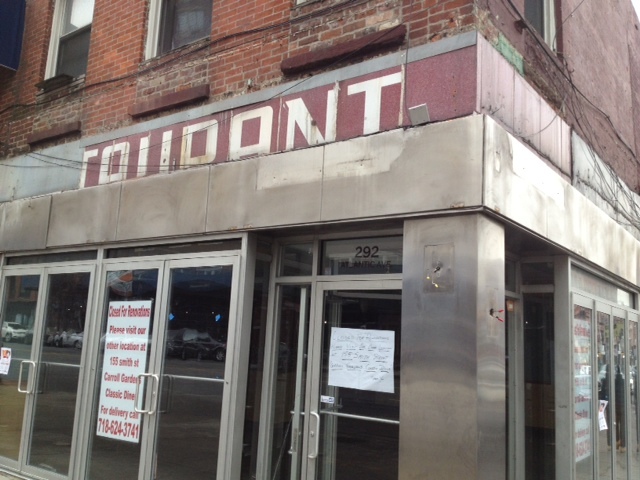 The space was bought by Joe Sitt of Thor Equities, the guy who destroyed Coney Island. It's supposed to reopen as a retail outlet. This is a shame. Though it never looked like much, the St. Clair is one of the oldest businesses in South Brooklyn. It opened 92 years ago. Almost nothing in the immediately area (maybe Staubitz Butchers) comes close. Jonathan Letham, the novelist who grew up nearby, has paid tribute to it. "The St. Clair restaurant has been here forever," he said in a 2003 New York Times article. "It's a very, very typical New York diner. People will say, 'Oh, we don't have a Greek diner.' They don't realize this is here. It's been here so long that it's totally invisible; no one sees it. So then a new Greek diner opens up down the street and it's exactly the same and all the hipsters go there for cheap eggs." While there's been a diner here since 1920, it seems it was called the St. Clair only since 1967. It was run by the Costa family from that year until 2007, when Spiro Katehis bought it and gave it an overhaul. Knowing Sitt, I expect this time he will rip down the old sign and toss it in the trash. 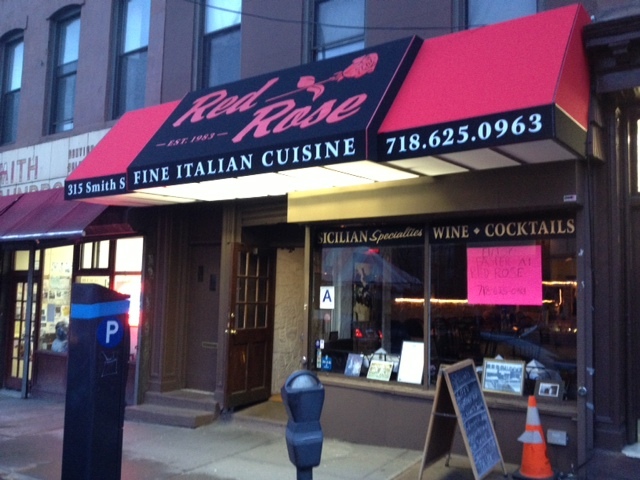 Carroll Gardens mainstay, the Red Rose, got a new awning this week, just in time for its 30th anniversary. I don't hate it. It's red, anyway. To see how the Red Rose looked when it opening, see here. To see it's more recent look, here.